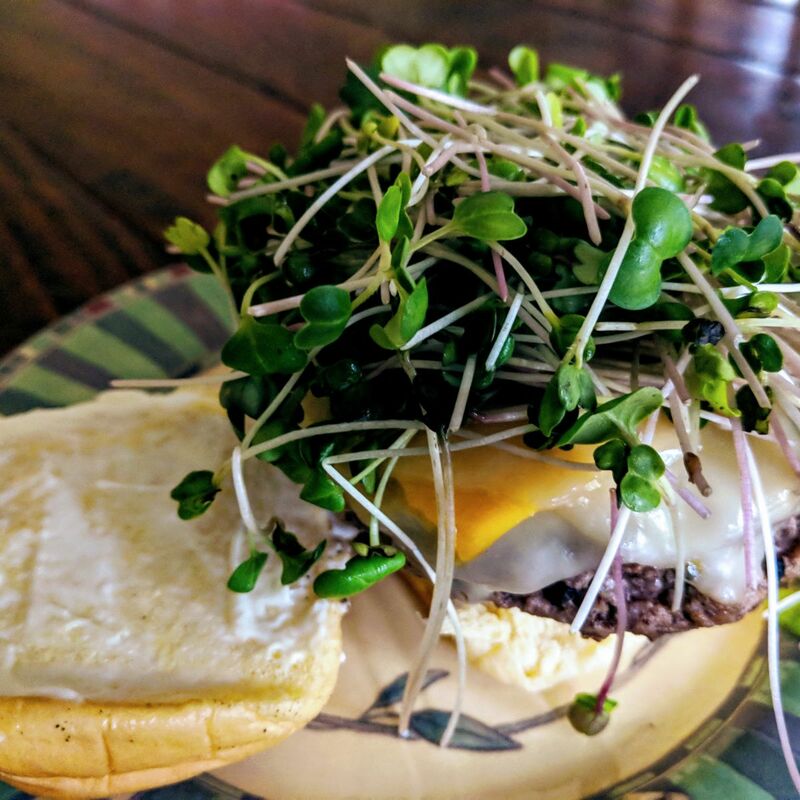 This is what you do with radish shoots; throw a pile on your cheeseburger! It’s finally here, the official start of the 2019 Street Fare Farm season. My calendar shows “Start CT Transplants” for this Monday. CT stands for Caterpillar Tunnel, of which there are two, both of which are still lying in a pile next to the field where they are to be constructed. Yesterday morning, before the rains came, I tilled the plot where the tunnels are to go, incorporating even more the chaff and residue from the previous inhabitants, as well as mixing in the lime and gypsum Hans and I had broadcast the afternoon prior. Oh yeah, Hans is back! More on his triumphant return shortly. Where was I… Oh right, so I tilled it all in, the soil was definitely a little too wet in certain spots to be doing so, but time is of the essence, for three weeks from Monday is a note in my calendar that reads, “Plant Early CT Crops.” My God, there’s a lot to do in those three weeks. I plan on installing the caterpillar tunnels on Tuesday, starting at 9am, in case any of you would care to join! After that, I have to run the irrigation up to the field, for which the well has yet to have power (but we’re so close! ), broadfork in the tunnels too loosen and aerate the subsoil, move my compost pile, tractor bucket by tractor bucket, from over here by the house up to the field, then spread that compost in the tunnels, ammend with fertilizer and stir it all in. And that’s just the beginning, for just under the “Plant Early CT Crops” tab in my calendar, there’s a note that says “Start 1st FC Transplants.” Here, FC stands for “Field Crops,” and once those get started, it’s a mere three weeks again to get beds broadforked, composted and fertilized, irrigation set up, landscape fabric pinned down, and in that span of time I’d also like to get some trees felled and logs cut to inoculate with mushroom spawn, and start transplants for the NorthEast Hospital Garden and the 2019 Plant and Herb Fest in April. I’m a mad man, but if I can pull this off this season, well, then I’ll have pulled it off this season! One thing that is pressing on the back of my mind is getting the walk-in cooler set up, because fresh vegetables need to be cooled if they are to last until I can get them into your hands and onto your plates! I dug out the side of the hill next to the patio where my post-harvest station is set up, severing my internet connection in the process, but there that pit sits, wet and muddy. I have to somehow grade the pit so that it’s tilting forward for water runoff, lay gravel, build a retaining wall, and pour the cement where the walk-in will sit. I’m beginning to think I may be a bit out of my scope for this project, and what with everything else on my plate, feel as though this is a job I should hire out for… That’s where you come in! If anybody has experience in this realm, or know somebody that does, I would love to work with you! There is one caveat, I’m about flat broke until the veggies start coming out of the field (or more of you sign up for the CSA! ), so I was hoping to find somebody to help with this job that would be willing to accept either vegetables and eggs, or even a full CSA share, as payment, or at least as subsidy to the total cost of the project? If that’s completely out of the question, is there anybody out there who would be willing to complete this project with a payment plan? I have outstanding credit and always pay down my debts! Please let me know! I hope to see you all at the Piedmont Farmer’s Market on Winecoff School Rd. tomorrow from 9am til noon! It’s going to be rainy, so wear your galoshes and bring an umbrella! Tomorrow I’ll have Microgreens and Eggs, and maybe I’ll bring along the prodigal Hans! He’s back from a month out west visiting friends and family in Boulder, Los Angeles, Monterrey and San Francisco. If he comes (I’m not sure he will), he will regale you with tales from his journeys, captivating your attention and mystifying your sensibilities! Maybe that’s extreme, but he’s fun to talk to. That’s all I have time for today, but I hope you all have a magnificent weekend and a glorious week! THERE’S STILL PLENTY OF TIME TO SIGN UP FOR THE CSA! It’s mutually beneficial, I promise!